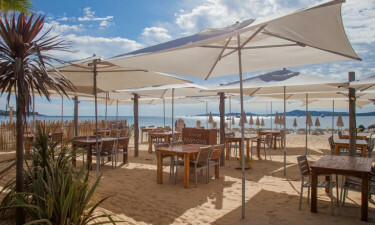 Thanks to its stunning location and luxury camping facilities, Les Prairies de la Mer is one of the top choices for anyone looking to take a break in the French Riviera. Booking your luxury camping site in the French Riviera is easy with Lux-Camp, so make your reservation online today. This first-class holiday camping site offers accommodation in many different categories. Guests can choose to stay in a 2 or 3-bedroom mobile home. There is a choice of settings too, as the mobile homes are located amid lush gardens or facing the seaside. Boredom is not an option at Les Prairies de la Mer. This five-star camping site offers a wide range of activities to ensure that every day is packed with new and interesting experiences. Some of the activities on offer include pilates lessons, salsa dancing, and cycling trips to St Tropez. 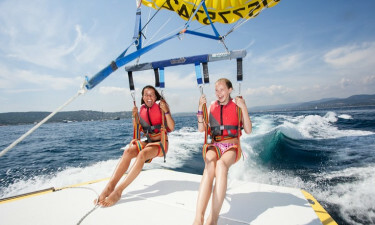 An on-site water sports centre offers the opportunity to go kayaking, take scuba diving and wakeboarding lessons, go sailing, windsurfing, or parasailing, among many other options. Guests have access to a fully equipped gym and are welcome to take part in the regular sports tournaments organised by the campsite. Experience the most authentic camping luxury and treat yourself to the ultimate pampering experience at Les Prairies de la Mer spa. Here you can enjoy a relaxing massage while listening to the waves, unwind at the open-air Jacuzzi, treat yourself to a rejuvenating beauty treatment, or experience the healing powers of a traditional hammam bath. Les Prairies de la Mer is home to five restaurants, each of which has its own character. The Canopy restaurant is perfect for a romantic dinner break, whereas the beachfront snack bar is great for a family lunch. In the evenings, all the action is centred around Long Bar, an atmospheric venue that serves cocktails, tapas, and specialty coffees. Guests can benefit from having two fully stocked supermarkets in the centre of this holiday resort, which sell everything from baked goods to typical products from southern France. There are other shops within the campsite grounds selling newspapers, magazines, clothing, designer cosmetics, and skin care products.